We at Ristras de Santa Fe strive to give the best customer service and the best quality products. We also strive to educate our customers about our products. If you dine in any New Mexico restaurant serving New Mexican cuisine, be assured that you will be asked the question: "Red or Green?" What does it mean? Well, it reflects what can only be called a local obsession that has even influenced state legislation. In 1996 the New Mexico State Legislature passed a House Joint Memorial declaring "Red or Green?" the official state question. This refers to being asked whether one prefers red or green Chili (Chile) when ordering New Mexican cuisine. This measure was passed to signify the importance that the Chili (Chile) industry has on the economy of the state. In 2000 New Mexico produced 99,000 tons of Chili (Chile) valued at nearly 49 million dollars making it the number one cash crop in terms of sales in the state. Chile is an indispensable part of the local cuisine (even McDonald's serves burgers with green Chile). Just be sure to select a restaurant or cook that does justice to this indispensable condiment. If you do, you will find that it becomes "love at first bite." Generally speaking, green Chili (Chile) is fresh Chili (Chile) that have been prepared into a stew or sauce. 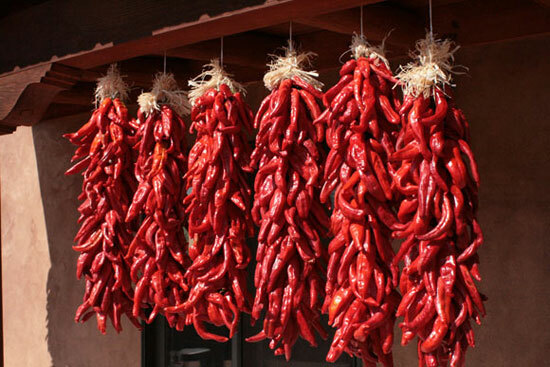 Red Chili (Chile) is dried before cooking, and generally have a sweeter taste. In fact, around the end of August, you can smell freshly harvested green chilies being roasted in rotating steel drums. It's an inviting scent that signals the beginning of fall. By the way, be sure that you call the local cuisine by its proper name. "New Mexican" cuisine, not "Mexican" cuisine. To an outsider it seems a bit frivolous at first. However, New Mexicans do have a distinct history and culture that we are proud of. And, whatever you do, don't pass up the "red or green" chile! Ancho Chile Powder Mild 8oz. Red Chile Powder 8 oz.